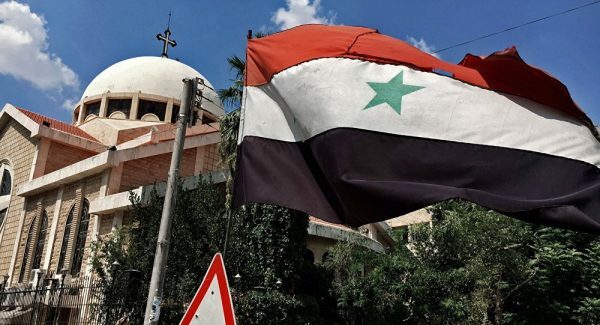 Samir Samaan, deputy director of the public assistance department at Aleppo’s Orthodox Sunday schools, said that the Saint Elias Cathedral in the Syrian city of Aleppo started receiving aid for Muslim families from the 1070 district who fled severe fighting. ALEPPO (Sputnik) — The Saint Elias Cathedral in the Syrian city of Aleppo has opened an emergency relief center for refugees fleeing war in the 1070 housing area in southern Aleppo, Samir Samaan, deputy director of the public assistance department at Aleppo’s Orthodox Sunday schools, said Saturday. “Today we have started receiving aid for Muslim families from the 1070 district who fled severe fighting. We try to give away essential things, hot meals and medicines. We help as much as possible with accommodation and medical care,” Samaan told RIA Novosti. Aleppo’s Orthodox Church is helping daily up to 150 families who have arrived from districts of Aleppo where clashes resumed, he added. A total of 4,000 families, half of which are Muslim and half of which are Christian, are under the constant care of Aleppo’s Orthodox Church, according to Samaan. Aleppo has been mired in intense fighting, with the Syrian army and local militia forces having managed to encircle large groups of militants in eastern districts of Aleppo. On Thursday, a three-hour humanitarian window with a total halt in hostilities opened in Aleppo, and would be in effect every day from 10 a.m. until 1 p.m. local time.